Want to perform better in the gym, lose more weight or simply boost your brain power? Well the best MCT oil powder can be a great supplement to do just those things and more. 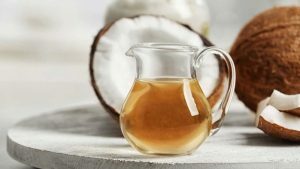 MCTs, or medium chain triglycerides, for a long time got a bad rap but are now seen as healthy and beneficial fatty acids that should be a part of your diet. As mentioned in our mct oil reviews 2018, MCT Oil is a very popular supplement for those striving to be better and more hard boiled. Unfortunately not everyone gets along well with this liquid. Some people can experience an upset stomach when consuming it and find that even when they try to start from smaller amounts, still struggle to make it work for them. ​​This can feel quite disheartening and may make you question whether MCT oil is as great as people make it out to be. Fortunately there are alternatives that you could use to straight oil. You can either get capsules or now powder form. Here we take a look at MCT Oil powder and the best powders on the market. MCT Oil powder is a game changer. 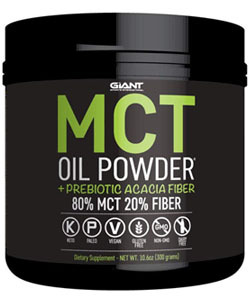 MCT powder has the same nutritional profile as MCT oil because it is made from the oil but just changed to a powder. MCT oil powder is made using a process called spray drying: converting MCT oil liquid into a powder form. his is widely used process in the food industrry for turning liquids into powders (e.g. powdered milk). The powder form is much easier on digestion than the oil and arguably easier to incorporate into your diet too. 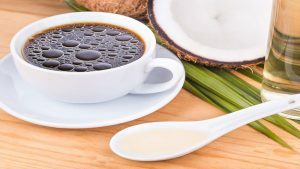 Many people do not like adding oil to their coffee or on top of their salads. MCT powder gives a nice alternative option when you're bored of putting the oil on everything. It's versatility means it is much easier to combine with other supplements. If you take other powders such as protein powder or even collagen powder, then you can more easily mix into MCT powder to keep the consistency to how you like it. Difficult to add into your diet if you don't want to just drizzle it on a salad or add it to a drink (the texture and oily film maybe offputting too). MCT Oil has a low smoke point which doesn't help either. The alternative to oil is either a capsule or powder. Powder is much more flexible when cooking or using and it is less likely to cause digestive upset. If you have struggled with oil, give them a shot! Convenience - Powder is easy to travel with and there is no concern of spillage like with liquid oil. Better on digestion - Powder form is easier on your digestion so may be better for people who struggle with MCT Oil. Combines with other supplements well - Oil tends to drift to the top or make drinks oily. It can be good to splosh over a salad but many do not get along with the taste and texture it provides in their morning coffee or smoothie. It also tends to stick to the sides of the blender and can be difficult to properly blend. Powder on the other hand is easier to mix in and works well with other powdered supplements you might want to use. There's something more cohesive about using all powdered supplements. Texture - If an oily texture isn't for you, you may prefer the texture of powder, which when mixed can be quite creamy. More versatile - It is easier to incorporate into your meals and can even be used in baked goods. Additives and fillers - Unlike oil that is completely 100% MCTs (well in most cases), with a powder form ultimately comes the likelihood that some comapnies will choose to add in fillers and additives which aren't exactly good for your health. Of course though, there are companies who will not be using such things and this is easily found by reading the label and looking at the ingredients list. Requires a carrier fiber - In order for MCT oil to be turned into powder it requires a carrier material. Carrier materials are not created equally and some brands may use poor quality fibers. MCT Oil doesn't require a carrier fiber and has less tampering during processing. Limited research - Whereas MCT Oil has quite a bit of research behind it, MCT powder doesn't. It's a relatively new product. 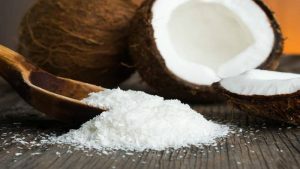 As with a good MCT Oil, the powder should also be made from 100% coconut oil rather than palm oil or a blend of palm and coconut oil. Besides the numerous environmental and ethical issues surrounding palm oil (if you don't know about these you must have been living under a rock - ​1), palm oil has to go through more processing than coconut oil does in order to get MCT Oil. Palm oil has to go through extensive reheating and sterilization. This changes the molecular make up of the nutrients which brings into question twhether MCT oil made from palm oil is healthy or not. 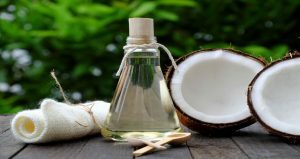 Coconut oil does not have to go through this heavy process. Instead there is minimal processing. Coconut oil is heated above melting point and left to cool. This separates out the MCTs. No solvents are required for this process. Look at the ingredient list or description. It should say MCTs from coconut oil or something similar. If it doesn't tell you the source find reviews or check their website. If you still can't find the answer either contact them directly or pick an alternative product. Check to see what carrier fiber is being used. If it is using tapioca starch or acacia fiber then that should be ok. These have health benefits which include promoting weight loss (​2), optimizing digestion (​3) and nutrient absorption and lowering cholesterol (​4). Try to avoid other carrier fibers. Additives and fillers are usually added for a number of reasons. They can extend shelf life of a product, improve the texture and most importantly for manufacturers, cut costs. As we any supplements you buy you should try to avoid too many ingredients in a product. They really are not necessary and will result in you having more or an equal amount of fillers to actual MCT oil. You may find that you can't always avoid some of these things but there are companies who do care about what they put into their products. Try to pick a powder with as little additional ingredients as possible. With a lot of powders. sweeteners can be added to make them more palatable. This is usually when its a flavored version rather than a straight unflavored version. Not all sweeteners are created equal and some can spike your blood sugar levels. Try to opt for a powder that uses stevia, erythritol or xylitol as aweetener. These do not spike your blood sugar levels like other sweeteners do. They also are zero calorie too. Some common sweeteners you should avoid include maltodextrin, glucose syrup, corn syrup, aspartame and cane sugar. Picking a high quality product may mean that it will cost you more but it will be better for your health and more effective. Of course, we don't all have lots of money to spend on supplements so try to do the best you can with the information you provided here and look out for sales. Generally MCT oil is made up of caprylic acid (C8) and capric acid (C10). These are the most effective and efficient fatty acids. Some companies go as far as only using caprylic acid (C8) in their product as this is more efficient than C10, converting to ketones in minutes. Try to go for one that has both caprylic acid and capric acid or for one that has just caprylic acid. Check labels and question the company if it isn't clear what it contains. There are not many powders on the market that we can recommend due to their ingredient content and lack of the most efficient MCTs. Many of them also contain a mixture of palm oil and coconut oil. Below are the 2 products we would recommend based on the what is available currently. This powder is so simple with only 3 ingredients to deal with. You have your MCTs and you have your fiber which is acacia fiber. It has a good ratio of the most efficient MCTs. It has 70% C8 or caprylic acid, the most efficient MCT, then 27% of c10 or capric acid. The remaining 3% is made up of C6 and C12. The MCTs also come from coconuts. Everything you need in a quality product. PROS – Only 2 ingredients and a high percentage of caprylic acid. Made from coconuts. CONS – Only unflavored available to buy. PROS – ​​Only 2 ingredients and a high percentage of caprylic acid. Made from coconuts. CONS – ​Only unflavored available. Perfect Keto pride themselves on using top quality ingredients with no fillers or additives. They work hard to provide a pure product and manufacture in a GMP facility in the USA. Each batch of their product is lab tested and their containers are BPA free. They have 70% C8 (caprylic acid) and 30% capric acid in their powder. Their product also comes from coconuts. They offer an array of flavors too (chocolate, vanilla or saltyed caramel) in case you want a different option to unflavored. In their flavored products they use stevia which won't spike your sugar levels. Some people do not like the taste of stevia and it can be overpowering if not used properly. So something to factor in. If you go for the unflavored version you get pure MCT powder and nothing more. If you opt for a flavored version there will be 3 additional ingredients and that's it. In the case of chocolate they are acacia fiber to bind (its also a prebiotic), stevia leaf for sweetness and cocoa powder for that chocolate goodness. Of course you could just add some cocoa powder to your coffee and MCT oil combo, rather than using this powder. 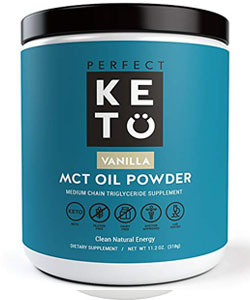 Perfect Keto also guarantee purity and are manufactured in a GMP facility in the USA. Each batch is texted to make sure it has a ratio of 70/30 of caprylic acid/capric acid. The container it comes in is also BPA free. This ​is simply one of the best mct oil powders ​on the market with a lot of positive reviews and a solid fan base of subscribers. PROS – ​Minimal ingredients, a few different flavors and high C8 levels. CONS – ​Price is slightly steeper. This product has a lot of positive reviews and a solid fan base of subscribers. PROS – ​​​​Minimal ingredients, a few different flavors and high C8 levels. CONS – ​​Price is slightly steeper. MCT powder can be used in several different ways. You can mix it into a smoothie, add it to your morning coffee or mix it into soups and stews. You can even add it to pancakes and oatmeal. MCT oil powder can be used as a pre workout too. You can add it to your pre workout shake or just mix into water and take. Check out our article how to use mct oil for more inspiration. MCT Powder can be a great way to add more MCTs into your life and thus more health benefits. This is a relatviely new product compared to MCT Oil and there are a limited choice of high quality products currently. Not all MCT Powders are created equally so make sure you read the ingredient list in the product you are interested in. 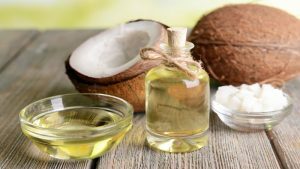 What Is Fractionated Coconut Oil & Is It Better Than Regular Coconut Oil?